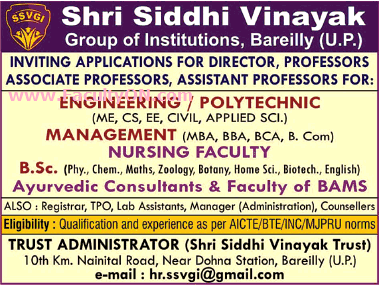 Shri Siddhi Vinayak Group of Institutions, Bareilly has advertised in THE TIMES OF INDIA newspaper for recruitment of Teaching Faculty - Professors / Associate Professor / Assistant Professor / Director Plus Non-Faculty jobs vacancies. Interested and eligible job aspirants are requested to apply immediately from 01st August 2018. Check out further more details below. About College: Shri Siddhi Vinayak Group of Institutions (SSVGI), aims that education is not limited to classrooms, it is a part of life; with the prime focus on maximizing the competencies, knowledge, inculcating professional ethics and values. SSVGI comprises Shri Siddhi Vinayak Institute of Technology (AKTU code 474), Shri Siddhi Vinayak Institute of Management (AKTU code 703), Shri Siddhi Vinayak School of Nursing (UPSMF code 1049), and Shri Siddhi Vinayak Polytechnic (JEE Code 2052).